I should have known she would be a girl. Even though I was carrying this way, and my belly looked too neat, and my pregnancy was too easy, I should have known. The chain of events that ushered her in was all too powerfully feminine. It was October of 2013 and there was an article in The New York Times entitled “The last Jews of Calcutta”. My husband Miguel read the article written about Jael Silliman, and then emailed it on to my family. “Your Dad thinks the surname is familiar” my Mum told me over the phone. She thought that maybe my grandmother Hannah Ezra had mentioned the family name from their life in India. But my grandmother had passed away almost thirty years earlier, the memory was vague and whatever the connection was, it was long lost. I did a bit of research. Finally I found a woman named Jael Silliman on Facebook. She was a writer and she looked Sephardi. I sent her a message and received a quick response. My father and his immediate family had left India for Australia in 1965. My grandmother had passed away in 1986. I had just discovered a connection to their family through a newspaper article, my Mexican husband emailed me in New York in 2013. It was outrageous! I wrote to Jael how excited I was, how deeply fascinated I was by my father’s childhood stories of India, how soulfully connected I felt to my Sephardi ancestry and to the vague yet thrilling tales of the relatives who travelled from Iraq and Iran to Calcutta at the turn of the century. I had spent hours in highschool researching and writing about this exotic heritage. I could trace back as far as my great grandparents on my grandmother’s side. “Well if you are interested in your family heritage” Jael emailed “you may like to read the book I wrote about your great, great grandmother”. My great, great grandmother?! I was baffled. You know who she was? You know her name? You know enough to write a book about her? It was the late afternoon, I was sitting at the window desk of our apartment in the West Village looking out toward Washington street. I googled the book. There was one copy available at the Strand Bookstore on 12th street and Broadway in New York City. Jael’s biography of four generations of Jewish women in India, was sitting on a shelf just blocks from my home. Barely able to contain myself I ran out of the house, along Horatio Street and across the city. I arrived at the store breathless. They located the book easily and handed it to me. If you are familiar with the Strand and its chaotic, eclectic assembly of books of all different periods and genres across three vast floors, you know how absurd this sounds, One simple book. As though it had been waiting for me all along. I stood there, at a table full of impressive, colorful coffee table volumes, with a humble hardcover in my hands. “Jewish Portraits, Indian Frames”. The buzz of the iconic village store continued, but for me time stood still. I opened the book to Chapter one. And there it was - a grainy, black and white, but very charismatic portrait photograph of my great, great grandmother Farha. I saw her face. I looked into her eyes. A woman whose name I did not even know a day before. But suddenly I held in my hands an entire chapter about her identity, her story. How a Jewish girl sailed from Baghdad to Calcutta in the late 1800’s to marry a man thirty five years older than her; What her temperament was like; how she spent her days. I held the book to my chest and tears welled up. In the middle of New York city, thousands of miles from where I grew up in Australia, thousands of miles from where my father grew up in India, I was transported further back than either of us had ever imagined. Just a few days later, I discovered I was pregnant with my first child. Nine months later I would meet her. And the parsha we read in the Torah that week? It could have all been a coincidence, and it could be something more. But whether this immaculate timing of events and the Jewish calendar was by chance or not, the message it holds was meaningful for me. Toldot which we also read this shabbat, deals with the birth of Jacob and Esav to Rebecca. It details the blessings Jacob received, which set the trajectory for his life and for all his descendants. In the previous weeks we read that Abraham was led up to the land of Canaan, and that Isaac his son was born there and never left. Isaac’s son Jacob, our third forefather would have a life journey that took him into exile. His life would usher in a reality for the jewish people that we are all too familiar with to this day. The blessings Jacob received, relate to his responsibility (and that of every person who would be born into his lineage) to seek out what is spiritual in this world, to see beyond the garments of physicality, to find connection to Hashem's life-force and in doing so create wholeness and healing. Jacob was the third generation inheritor of a spiritual currency. It was up to him to grow and expand upon the unbelievable wealth he had been gifted. We are charged with this same mission. This unique purpose is a thread which spans generations from Jacob until the end of time. Sometimes the yarn is delicate and sparse, other times it may feel coarse and firm as rope, it can also feel pulsing and vibrant as the drum of blood in an umbilical cord. We each encounter the thread at a different place and manifestation. Nonetheless, it is for us to trace it back in order to know who we are, and it is our job to keep spinning it, so that our great, great grandchildren have their own span of the yarn to hold. Holding that thread feeds our souls and it has the power to bring light to all the world. I found myself in this space - the space between knowing my great, great grandmother, and knowing the child I was carrying. The connection to each of them was miraculous. I was awestruck to witness my existence in this precious chain. I was humbled to realize all at once both my smallness in the continuum, and my absolutely essential role. A few years ago, my friends and I started to use a phrase “living the Parsha” when we would notice how our life events correlate to the lessons we read in the Torah. Discovering another part of the yarn from which I was woven, is the essence of Toldot lived out in the present day and I am still filled with wonder and gratitude to have experienced it. 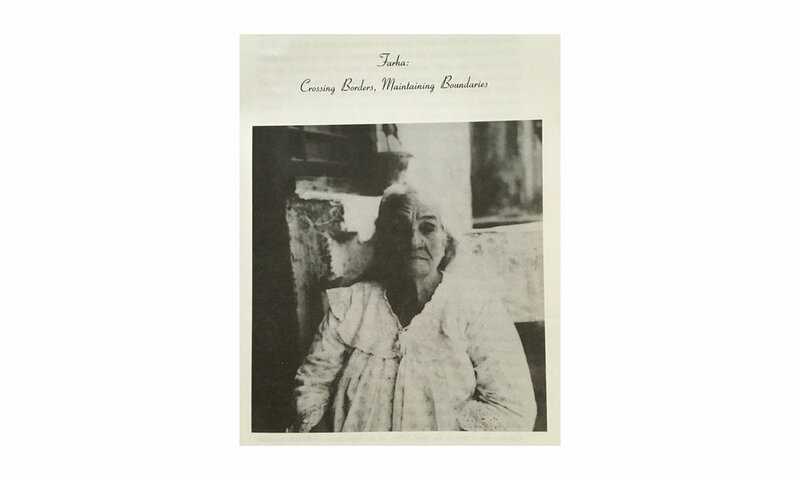 Image of Farha in Calcutta, India, from "Jewish Portraits, Indian Frames: Women's Narratives from a Diaspora of Hope" by Jael Silliman.